The March/April 2016 newsletter of the Portland Oregon Branch of the R.S.C.D.S. Spring Fling Trial Dancing in Vancouver, Wash.
With the Workshop and Ball just around the corner on Saturday, March 12, it’s time we went through the rules of etiquette again – just a reminder so that we all have a wonderful time. Remember to try to dance with as many partners as possible. Women need not wait to be asked to dance; it is entirely acceptable to ask a man or another woman to dance. Experienced dancers should ask beginners, and beginners should not be shy about asking more experienced dancers. Be sure to especially remember to ask out of town visitors, so that they will feel welcome. We want people to think of our group as one of the most friendly and inclusive. Also remember to ask briefers (and hold a place for them on the floor) and teachers – especially the visiting teacher. A limited amount of booking ahead is acceptable. For example, if you are not experienced and you have practiced a particular dance with a particular partner, you may feel more comfortable dancing that dance with that person. Also, romantically linked couples may want to dance a particular dance with each other. However, a person who does a lot of booking ahead gives the impression of excluding people instead of trying to be sociable. In our area, we usually have the Band play the first 8 bars to announce the next dance. Sets should form only when announced by the music, not before. Couples should join sets at the bottom rather than squeeze their way into the middle or top of a set. Conversations should stop while the briefer is talking. Even a quiet murmur, when multiplied by many people, makes it very difficult to hear. Please allow other dancers to hear the instructions. Experienced (or coherent) dancers should try to help any unsure dancers in an unobtrusive way. Use hand motions to point them in the correct direction or quietly tell them the name of the next figure. Even experienced dancers forget what they’re doing from time to time. Helping each other adds to the team spirit and enjoyment. Shouting and/or pushing is not helpful. Remember to maintain eye contact with your partner and with the other dancers in your set. Relax and enjoy yourself. Every dancer in your set is dancing with every other dancer in your set, so this is not a time for solo showing off or drawing undue attention to yourself. Above all, smile. A big smile will cover a lot and will make everyone feel good. Each dance ends as it began, with a bow or curtsy to your partner – and a smile! Be sure to thank your partner and thank your set. Don’t linger on the floor; the dance floor should be clear between dances. Partners should lead each other off the floor before looking for a new partner. Mingle and socialize during the breaks and be friendly and encouraging with beginners and visitors. The After Party this time will take place downstairs immediately following the Ball. Please allow visitors to head downstairs first and lend a hand with the clean-up operations upstairs for a few minutes. The Band and Soundman may also need help breaking down their equipment. Please do bring musical or rhythm instruments and your singing voice to add to the party atmosphere. 29-32 1L4L turn by the left 1½ times WHILE 1M4M turn by the right 1½ times, finishing 2s3s4s1s. 25-32 1s+2s dance Poussette. Ends 2-1-3; repeat having passed a couple. 29-32 1s turn both hands 1½ times, finishing 2s1s. 25-32 1s set & cast down 1 place, 1s followed by 5s dance up between 4s & cast - 1s to 5th place & 5s to 4th place. Ends 2-3-4-5-1. 33-40 2s1s3s 6 hands round and back. It’s a dark January morning. It’s early, and it’s cold. Cold made even colder because I’m nervous. 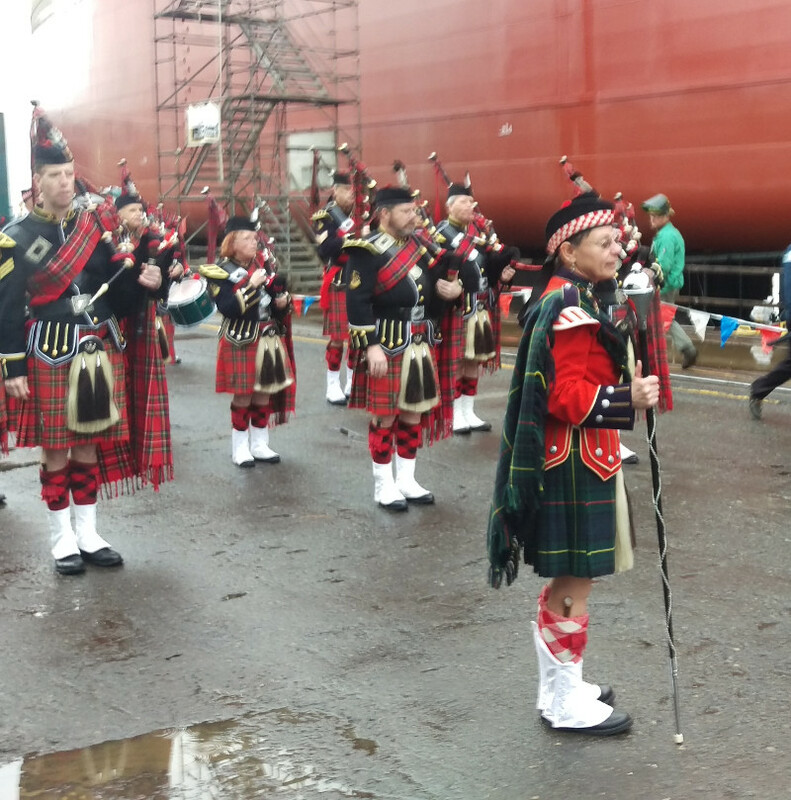 This is the day I will make my debut as Drum Major for the Clan Macleay Pipe Band at a “barge launch” for Gunderson Marine. That’s right – out there in front of everybody and everybody else – leading the band. Will my voice come out as a mere squeak the first time I try to give a command? Do I even remember how to walk? At this point, on the way to the launch site, it’s hard to say. We arrived at the launch site at “0 dark-thirty” and made a couple of attempts at finding where to park before actually settling into a spot. The Pipe Major, whose job it is to worry about the music (my job being “everything else”, as my trainer drilled into me) actually took the time to walk with me through the parade course before everyone else arrived. We got stopped a bit short of where we were supposed to go, as there was still a gigantic crane in the way, but we did get an early look at the barge. It was impressively huge! About 3 stories tall and very long, it formed kind of a canyon between it and the building behind us. I did NOT forget any of the pieces of my uniform, of which there are SO many – shoes, short socks, sock tops, flashes, sgian dubh, spats. Now we’re up to the knees. Kilt, horse-hair sporran, kiltpin, plaidie, plaidie brooch, t-shrit, tunic, collar brooches, belt, and hat. We were not wearing feather bonnets due to the threat of rain, so I did not have to worry about balancing my hat on my head, and/or knocking it off with the mace. The rest of the band arrived in fits and starts and in various stages of dress. Coffee and donuts were provided by Gunderson Marine, our wonderful corporate sponsor, whose barge we were to officially launch. Eventually, with much chatter and camaraderie, everyone was fully dressed, pipes and drums tuned, and all turned out onto the wet parking lot to line up and march off. As a drummer, you wait at the back of the band to see what formation the pipers will take, then get into a similar formation and hang out until someone barks out some orders that tell you when to start. Then, you step out on the left foot following the person in front of you, playing along as best you know how. I must have done this over a hundred times. One might think that having listened to the marching orders over a hundred times that one would automatically know exactly what those orders were. But perhaps not. As drum major, I had to be told where to stand, and pretty much what to say. We had not had a chance to practice this beforehand, as we are now holding band practice in a church basement with a fairly low ceiling. To add additional complexity and pressure, just before we were about to march off, the Scout Leader in charge of the Boy Scouts who were to be our color guard, came over to request that we (I) give an order to the Scouts about when to start off. It was suggested that I say “March Out the Colors”. I really wanted to say “when you hear the music, start walking”, but agreed to their request. So, the moment of truth arrived. “Pipes and Drums,” I hollered out in my loudest voice, and it did NOT come out as a mere squeak! “A’Shun!” And the band responded by standing at attention! Even the drummers in the very back! “By the Right (beat) Quick March!” At this, I had to make a half turn on both feet, bring the mace from my right hand to my left across my body, make a marching step with my left leg and begin marching on my left foot. I had practiced this move many times and it went smoothly, although I’m sure it could have been sharper and more militarily precise. We marched about half a block to the gate, and the band circled up. I wasn’t quite sure where to stand, so I made something up. I wasn’t quite sure how and when to do the fist pump to stop the band, but the bass drummer and I had worked out ahead of time that he was going to do the double beat at the correct time regardless of when I did the fist pump, so only he and I knew that we weren’t always together. I called off and stopped a few more sets before I remembered that I was supposed to say “Ready” before I did the call off. I had not practiced yelling out the names of the sets. I got a little tongue-tied on “Pipes and Drums!” “Bathgate and Breadalbane Gathering!” “Ready!” “At the Ha’ (beat) One, Two!” We did a few more sets before the grumpy gate guard came by to say it would be a few more minutes, as they were moving the crane. Here’s how it was set up . . . There’s a short driveway up to a guard house and electronic gate. The Band and the hundred or so spectators huddled under their umbrellas (did I mention it was raining? – not hard, just nice misty rain) were in front of the gate, waiting for it to open. The Boy Scouts were about 30 yards past the gate on the inside, under some sort of roof, waiting for their orders. They shut down the traffic on the Willamette River for the barge to be launched, so it’s pretty imperative that the whole procedure goes off on schedule. We were surprised to have been held up for so long. The Band was to play in a circle until the gate opened, then parade through the warehouse to the Barge (maybe 75 yards or so). Eventually, the gate opened. Yay! “Okay,” says the Pipe Major, “Let’s do this.” So, again I holler out to get the Band at attention (even though they’ve been at attention the whole time), then remembered I’m supposed to yell something at the Boy Scouts. I turn away from the Band and holler “March out the Colors!” I turn back to the band and holler out “By the Right (beat) Quick March!” and make the turn without tripping or falling over, and smartly march out in front of the band. I didn’t know until later that I had marched out taking extra long steps. What can I say? I was excited. (I blame Holly, who has trained me to use the extra long steps when we go walking – you can cover a lot of distance without using up too much energy.) Even the front row of 6’5” pipers were impressed by how quickly I was moving. The short little tenor drummers, in the back, hobbled by having a drum on one leg were not amused, and apparently had to pretty much pick up their drums and run to keep up. The Band marched smartly through the warehouse, made the left turn at the barge and began to march the length of the behemoth barge. It was at least the length of a football field. I knew we had to do a counter march at some point, which involves some precision mace work. The crane had been in the way, so I didn’t know how far down to march before I turned the Band around, and started to at one point, but heard the Pipe Major behind me saying, “Not Yet, Not Yet!”. Then he says, “Okay, Now!” and I did it! Grasp the mace with the right hand, turn it 180 degrees horizontally, swing it up to the right shoulder so that it is pointing straight up, take one and a half steps forward, take three steps to turn around and head back through the band. Once past the last drum, turn the mace to point down, place it back into the left hand, keep marching. And when I halted the Band, they all halted, and when we stopped the music, the bass drummer and I were in agreement about when the double beat was supposed to happen. Whew! The rain had picked up a bit by this time, but because of the delay with the crane earlier, they had to compress the ceremony, so we didn’t have to stand out there for too long. There was the Pledge of Allegiance, some thank you’s to honored guests, the playing of Amazing Grace – one piper on the barge answered by the Band on the ground, quite impressive and moving – a prayer, a couple of champagne bottles smashed against the side, and then “Crack” and the rails holding up the barge drop and the whole thing slid into the water. It’s pretty exciting to watch, and I was able to actually relax and enjoy it. And then, no dilly-dallying around after. We got the Band back in order, called off and marched out. I marched with a more reasonable gait on the way out, which the tenor drummers thanked me for later. Along the barge to the way out, a right corner, through the warehouse, back to the electronic gate, a left corner and on to the building where we had started. I was so giddy by the time we got there I forgot how to stop the band properly, and just stopped. Thankfully, they all laughed and stopped with me. Then almost every band member patted me on the shoulder and told me “good job”, which was wonderful. My good friend, the lead stick (boss of the drummers), mentioned that my voice could/should be about an octave lower, and that I had my plaid draped over the wrong shoulder, and that I had countermarched through the left file of the band, rather than the right, which was more conventional. And really, those constructive comments were most welcome and helpful, and given after the fact, when they could be better absorbed. I think most importantly, I had a chance to be a brand new beginner again. I have a much better memory, now, about how it is to be a beginning dancer. When there’s too much new information coming in, everything is confusing, even stuff you used to know. And when someone has that wild-eyed look, we experienced dancers need to recognize it. That is the time to give only essential information and nothing else. Beginners rock! I have been attending Lisa Scott’s Oldies But Goodies dance class, intended to be a gentler, low impact class for dancers, and emphasizes the social aspects of dancing. The class meets 2nd and 4th Tuesdays, 7:30 to 9:00pm, at Columbia Dance Center. The class is meeting the needs of about twelve dancers so far. Lisa begins with some gentle warm-up and stretching to soothing music. She combines her extensive musical background with teaching the dances. Some challenging formations like “set and turn corners” are replaced by easier formations like “turn first corner by the right and turn second corner by the right.” Each dancer has the option to dance formations with full energy or low impact. We have an opportunity to learn the Oldies but Goodies dances. Or are we dancers the Oldies but Goodies?! By Tom Halpenny A set of 5 Strategic Aims had been adopted at the RSCDS Annual General Meeting 2015. The RSCDS Management Board, committees, and HQ staff attended the annual training meeting of RSCDS Management Board and committees members in Edinburgh on Saturday, January 9, 2016. Executive Officer Gillian Wilson facilitated a discussion of the 5 Strategic Aims in order to develop the next level of detail. Instead of discussing Activities (methods), participants were asked to write priority Change statements (more specific goals) that describe how the Society will look, after improvements have been implemented. A Business Plan Working Group can then identify the prioritized Activities that will effectively accomplish the Change statements. The timeframe calls for a business plan to be developed and presented to members for the November RSCDS AGM 2016. The Change statements are determined by identifying problems: What stops us from achieving this aim? We then turn the problems into positive suggested priority Change statements. RSCDS general image is “have to dance properly” / unfriendly / unrelaxed / “old fashioned”. Branches often have the same image / some branches are unwelcoming. Ceilidh dancing is seen as fun and exciting but RSCDS is not associated with this / we just focus on SCD and not other types of related dance. Public in non-Scottish contexts does not know what Scottish Country Dance is / there are other local country dance traditions. Insufficient linking and partnership with other dance forms and dance organizations. RSCDS communications to members and branches are often Scottish / UK focused and something that works in Scotland does not necessarily work elsewhere / internationally. The RSCDS portrays itself as a fun, sociable, healthy, inclusive and family friendly organization, in collaboration with its branches. RSCDS is recognised as a leading organization for Scottish dance and music in Scotland and internationally. The RSCDS is involved with ceilidh and other related dance forms. The general public is aware of the different forms of Scottish dance. RSCDS works effectively with relevant dance, music and arts organizations in Scotland and internationally. RSCDS is an internationally relevant and accessible organization. Next comes the challenging part. A Business Plan Working Group will soon begin to gather input from Society stakeholders and will identify workplan options. We will ideally reach a balance of collaboration and networking amongst the small Headquarters staff and the volunteer committees, branches, and affiliated groups, with international and intergenerational perspective. Sometime in the spring of 1985 (or was it ’86?). Never mind, when is not too important. I was living in Birmingham, Alabama and had gone to Atlanta to attend a Neil Diamond concert with my friend, Jane McLendon. It was great. I was ready to go again the next night, but Jane already had other plans. She was going to a Scottish Country Dancing event. Scottish Country Dancing, what’s that, I wondered. I’d never heard of it. I don’t remember much about it except that there was a nice crowd of people there, all friendly, with the women in pretty dresses and the men in kilts. I’d guess this may have been the first time I ever saw kilts. It was definitely the first time I’d seen dancing like this. It looked like a disorganized melee, and the music all sounded alike. I couldn’t quite imagine why at that point, but everyone seemed to be having a lot of fun. While I lived in Alabama, I tried to do as many things with Jane as possible. That mostly meant tagging along on various trips to dancing events. I remember going to things in Atlanta, to something in Kentucky and something else in Nashville, the only time I ever got there. Jane tried hard to teach me some steps, and occasionally persuaded me to participate in an easy dance. (Easy! There is no such thing!!) My feet wouldn’t cooperate. I’ll stick to taking pictures of other people dancing. Fast forward to September ’95. I’m now living in Longview. Jane, and some others from the Atlanta group flew to Seattle to attend the Seattle’s group’s event at Fort Worden. I joined them for a day, again watching and taking lots of pictures. At Fort Worden I met Ken McFarland, and Jane explained that Ken had been organizing various trips for dancers. She said sometimes non-dancers could go. Which led me to going along on the cruise to Alaska last summer. Well, if I was going to hang around with these dancing folk, maybe I should learn something about it. Robert McOwen’s ladies’ step dancing classes helped me start making just a bit of sense of it. To my amazement, last fall I discovered there are two classes a month in the Longview/Kelso area. Thinking about going along on another Ken McFarland trip, I began my dance career. Classes: Sally Bledsoe teaches the class. She is very ably though informally assisted by Fred and Marge van Nus, who drive some 80 miles round trip to help out. There are four or five other (fairly) regulars and a changing cast of beginners like me. There are some basic things about Scottish dancing that are NOT immediately obvious. Like progression down the set. Having walked the dance a few times, once we started, I thought once I got through it once, we were now the second couple or third or whatever. I was totally lost for the rest of the dance. I am still trying to figure out which couple I’m part of, and if my partner can’t keep track of it, oh well, our dance is a mess!! Corners: By now, most of the time I can remember which is my first and second, but that took some doing. Reels, right or left shoulder. Just keep winding in and out of the other people till the music says stop. Poussette: My partner had better be able to push me through it, or I’m lost. The Steps: I can manage the strathspey when the group is following Sally around the floor, but in a dance my mind can deal with only one thing: trying to be where I’m supposed to be at the end of the figure. Forget the steps!! On your toes! Fred must remind me a dozen times during class. As I got better at it, my legs got better at protesting. Twice after class I was up an hour after bedtime, walking around my apartment trying to work out the cramps. HAVE YOU LEARNED ANYTHING? With perhaps 10 to 12 classes and one dance behind me I set off for Hawaii with Ken McFarland’s group, looking forward to the week of dancing. Well, with a stellar dance master like John Drewry leading the classes as they learned new, intricate and beautiful dances, it was back to the camera. But all was not lost. At least I knew what he was talking about! There has been one glorious moment so far. It happened at the dance in Vancouver in February. I knew what I was supposed to do, and so did everyone else in the set. We completed the dance as though we knew what we were doing and most of them did(!). It was a thrill. I told Jane I finally figured out why so many people enjoy Scottish Country Dancing. Someday I think I will, too. by John Shaw I recently received a copy of Ken McFarland’s newsletter wherein he describes many items of interest from his recent travels to Scotland. Ken spent some time at the National Library of Scotland in Edinburgh, researching country dances and dancing, and he describes some of his findings in his newsletter. That web page gives you a text box for entering a word (or words) for which to search. I entered “Scottish”, of course, and it presented me with a list of about 70 books containing something about Scottish dance. The publication dates on these books ranged from the 1700’s to the early 1900’s. Fifty years ago or more, the Country Dance was the only one danced in this country, except in the cities and large towns, where several fancy dances were occasionally performed; but even in those places the Country Dance reigned triumphant. The dances that were at that time the most fashionable were: “ Fisher’s Hornpipe,” “Chorus Jig,” “Sir Roger de Coverley,” “The Cushion Dance,” “Money Musk,” “Speed the Plough,” “The Devil’s Dream,” “College Hornpipe,” “Rustic Reel,” “Six Handed Reel,” “Reel fore and after a straight four,” “Durang’s Hornpipe,” “The Sailor’s Hornpipe ,” & c.
This next excerpt is Howe’s explanation of the dance, Money Musk; can you follow it? First couple join right hands and swing once and a half round, go below 2d couple, (the 1st lady goes below 2d gent. on the outside, 1st. gent. at the same time goes below and between 2d and 3d ladies), forward and back six, 1st couple swing three quarters round, 1st gent. goes between 2d couple (on the inside), first lady goes between 3d couple inside, forward and back six, 1st couple swing three quarters round to place (below one couple), right and left four. 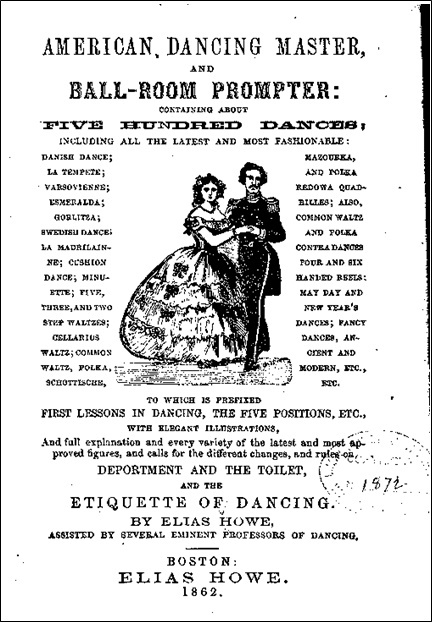 I think descriptions of Scottish Country Dances have come a long way! To the right is an image of the title page of Elias Howe’s book. Notice the line near the hand-written date, “DEPORTMENT AND THE TOILET”. I determined, from this book and a couple of others, that “Toilet” refers to the proper dress for the occasion. Come join the fun for a low key 90 minutes of SCD. Tempos are a bit calmer, some formations are modified, and dancers are encouraged to make the dancing work for their physical ability. We have done dances from the RSCDS books 1 and 2 and will be heading on to dances in books 3 and 4 through March. The class starts at 7:30 on the 2nd and 4th Tuesdays each month and is held at Columbia Dance Studio in Vancouver, WA. For more info please call Lisa Scott at 971-227-8902. After a stint in New York City during the American Revolution, McAdam returned to Scotland in 1783 with a small fortune. He bought an estate in Ayrshire and became the district’s road trustee. After observing the poor road conditions, McAdam started experimenting with improvements at his own expense. These experiments were continued in Cornwall, where he built raised road beds of cheap, local rock. The beds were then covered with smaller rock, and bound together with gravel, stone dust, and water. McAdam wrote treatises on road construction, and was eventually appointed Surveyor General of Metropolitan Roads in Great Britian. His “macadamization” process quickly spread to other countries, paving the way for the modern highway. Dunlop was born in Ayrshire, and trained as a veterinary surgeon in Belfast, Ireland. He conceived the idea for an air filled tire while trying to reduce bicycle vibration. In 1845, a patent had been granted to Robert William Thomson, but no practical uses were found for the invention. In 1888, Dunlop was granted a patent for an all-rubber inner tube, protected by a rubber-treaded canvas jacket. Commercial production of his tires began in 1890, and Dunlop’s company was subsequently granted patents leading to the modern wheel and tire. His name was Fleming, and he was a poor Scottish farmer. One day, while trying to eke out a living for his family, he heard a cry for help coming from a nearby bog. He dropped his tools and ran to the bog. “No, I can’t accept payment for what I did,” the Scottish farmer replied, waving off the offer. At that moment, the farmer’s own son came to the door of the family hovel. “Is that your son?” the nobleman asked. “Yes,” the farmer replied proudly. Someone once said what goes around comes around. When you help someone else you are bringing joy into your life also. I attended my first Scottish dance in Scotland 9th January 2016, the formal Trinity SCD Club 63rd Annual Banquet and Ball. I was particularly keen to meet new friends and observe how people socially interact. Dance event organizers Colin and Joan Tyler were very friendly and welcoming. The format is similar to the Southwest Washington State Branch Dinner Dance. Guests were assigned seats for the 7:30 banquet with thirteen tables of ten guests each. I had pleasant conversations with fellow diners at my table. The dance programme began at 9:00 after the tables were cleared from the floor. Alastair Wood and his Scottish Dance Band provided the energetic music with two accordions and keyboard. In a departure from prior years, the dances were briefed this year. (Dancers must have been pretty familiar with the programme during earlier years!) I enjoyed dancing with some of about ten RSCDS management committee members, whom I had met in the Away Day strategy meeting earlier in the day. I pulled out my sheet of Minicribs to refresh my memory of the next dance, while Keith Rose, who is famous for generating thousands of Pilling style dance diagrams, read his sheet of ball programme diagrams. Since the bus stopped running before midnight and it had been raining pretty steadily, the event hosts Joan and Colin were kind enough to drive me past my hotel, while delivering my polka-partner to the airport for an early flight. After a busy day of meeting and dancing, I slept well until a leg cramp hit me at 3:00am. I got back to sleep but jet lag returned and I ended up sleeping the day away. I emerged from my windowless room around 5:00pm and strolled into the evening for a final walk through Edinburgh streets before flying home the next morning. 25-32 giving right shoulder to 3s to start, 1s dance parallel reels of 3 on own sides, finishing 2s1s3s.